There have been some changes to Rinpoche’s schedule necessitated by Rinpoche attending some private teachings given by His Holiness the Dalai Lama in India recently. Rinpoche has just left Malaysia for Amitabha Buddhist Centre, Singapore, April 23 – 27th for teachings on the 3 Principles of the Path ; April 29 – 30th Rinpoche will give the Great Chenrezig initiation, then May 5 – 7th Rinpoche will give Heruka initiation, and on May 8th the Cittamani Tara initiation. Rinpoche then travels to Cham Tse Ling, Hongkong – the main teaching events are Ksitigarbha retreat, May 14 – 16 and Amitabha initiation on May 25. 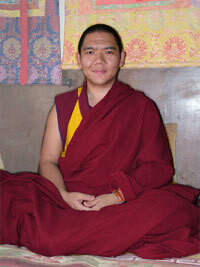 Rinpoche will then return to Taiwan to continue the teaching program which was interrupted there. The program will begin on June 2nd and will include White Tara Initiation on the 3rd; June 4th and 5th at Heruka Center with Lama Chopa Commentary and Lama Tsongkhapa long life initiation. Then June 11th and 12th at Shakyamuni Center to continue the Lama Chopa Commentary and give Black Manjushri Jenang. June 18th and 19th at Hayagriva Center, Lama Chopa Commentary continues , together with Chenrezig Liberating form 3 Lower Realms jenang. June 25th and 26th at Jinsiu Farlin where the Lama Chopa commentary continues and the program ends with a Long Life Puja and Ksitigharba initiation. Rinpoche will teach on the 3 Principles of the Path and give the Medicine Buddha jenang at Longku Zopa Gyu Center in Switzerland on August 14th and 15th after His Holiness’ teachings in Zurich. Then we move to the USA where on Sept 10th-11th Rinpoche will give teachings and a long life initiation organized by Guhyasamaja Center. accepting for their teaching schedule to be re-arranged. This was a very special occasion when HHDL gave the rare teachings and initiations on the visions of the Fifth Dalai Lama – Sangwa Gyechin. Initially these teachings were going to be by invitation only, in His Holiness’ private temple, but eventually more and more people were allowed to attend and the teachings became public (more about these teachings to come in Mandala). Dagri Rinpoche, Lama Zopa Rinpoche, Oser Rinpoche, Khandro-la, and Dagri Rinpoche’s attendant having dinner together in Rinpoche’s room in Tushita. During this time there was a Hayagriva puja organised for Maitreya and FPMT projects with many high lamas, including Ling Rinpoche, Khamtrul Rinpoche and Dagri (Pari) Rinpoche. At the beginning of the puja Jhado Rinpoche (ex-Abbot of Namgyal Monastery) got up and made a surprise request for Lama Zopa Rinpoche to accept a long life puja. 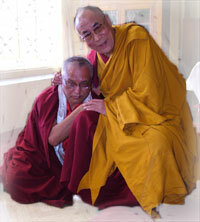 Jhado Rinpoche stood requesting for 20 minutes before Rinpoche finally accepted. Then they continued with the puja. considered a very special being. Rinpoche met with HH Serkong Tsenshab Rinpoche, who was very clear on how important the Maitreya statue is and why. Ven Roger returned later to video HH Serkong Tsenshab Rinpoche about this at which time HH Serkong Tsenshab Rinpoche also explained how important Lama Zopa Rinpoche and all his activities are, yet that whenever HH Serkong Tsenshab Rinpoche meets Lama Zopa Rinpoche he always appears as just a very simple monk, and that this is a very real sign of a great Lama. Ven Roger reports that HH Tsong Rinpoche is very warm and very very sharp – he is already known in the three great monasteries as an excellent debater. An example of his commitment is that once the debate bell rang when Rinpoche was in the middle of his lunch, yet he immediately left without the slightest hesitation, leaving the food behind! A photo taken by Ven Roger Kunsang of the very attractive entrance to the Maitreya Project office in Taipei, with Rinpoche with the Taiwan resident geshes and lama gyupas doing puja for success. ‘May His Holiness have a stable life. May the mainland Chinese government officials change their minds, become devoted to His Holiness, and do exactly as His Holiness wishes, as quickly as possible, without delaying for even a second. May the Chinese give Tibet back to the Tibetan people, and may His Holiness guide them continuously. May Buddhism be preserved and spread more than before. May there be more buddhas and bodhisattvas even than there were before in Tibet. 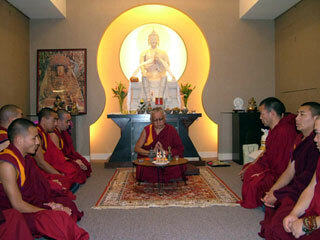 Through this may Buddhism spread all over this world and flourish forever. May we become His Holiness’s heart disciples, offer service, and become most pleasing to His Holiness. May we be able to fulfill His Holiness’s holy wishes in all our lifetimes. May all the funding for the Maitreya Project be received without the delay of even a second. May the bank people be in harmony, be incredibly devoted and compassionate, and give all the funding as quickly as possible. May the Maitreya statue be constructed without the delay of even a second. May it be completed and abide in this world until Maitreya Buddha comes. May it be extremely beneficial for all sentient beings, causing them to collect extensive merit, purify all defilements, and achieve enlightenment as quickly as possible. May all the funding be found to build and support monasteries and nunneries in different parts of the world and to help all beings’ needs and education. May we be able to build holy objects in different parts of the world in order to purify sentient beings’ defilements and negative karma, collect extensive merit, and bring them to enlightenment as quickly as possible. May we actualize social services in different parts of the world to help the bodies and minds of the people and cause them to meet the Dharma. May we be able to provide all the funds for all the centers that have debts and projects. May all the centers be most beneficial for sentient beings, causing them to develop faith in refuge and karma and to actualize bodhichitta; especially may they spread the complete teachings of Lama Tsongkhapa in the hearts of all living beings. May all the students and benefactors of the FPMT, especially those who give up their lives for this organization offering service to sentient beings and for the teachings of Buddha, have long, healthy lives. May all our wishes for the holy Dharma be immediately successful. May we be able to actualize the stainless teachings of Lama Tsongkhapa in this very lifetime without the delay of even a second. May all the FPMT Sangha have long and healthy lives and be able to complete the scriptural understandings and realizations on the path to enlightenment in this very lifetime by living in pure Vinaya and by having their lives protected. May we be able to build a large stupa in this area (Washington), carve a big image of Buddha on the rock, and enlighten numberless living beings as quickly as possible. Ven Wongmo: if we recite sadhanas with Rinpoche in Tibetan, not understanding the meaning, is there still benefit? Rinpoche: if you tell me something important, but I don’t understand the words but pass the message on to someone who does understand the words and benefits from them, is there benefit? The deities, buddhas understand because what we’re reciting are praises and requests to them.